Moving from pilots to mainstreaming – opportunities and challenges of scaling up Ecosystem-based Adaptation: As a UNFCCC SB48 side event, the 3rd EbA Knowledge Day brought together UN negotiators, policy makers, practicioners, researchers and donors working on issues relevant to climate adaptation, ecosystem management and human resilience. More than 60 members from 30 different organizations participated in the full day workshop. After a welcoming address by Lea Herberg from the Federal Ministry for Environment, Nature Conservation and Nuclear Safety (BMU), the EbA Knowledge Day featured two Panel Sessions: During panel 1, representatives from CBD, KFW and SDC addressed opportunities and challenges in EbA upscaling from a donor and policy maker perspective. During panel 2, representatives from Practical Action, ICRC, CARE Climate Change, CI Columbia and the Ministry of Environment and Forestry in Indonesia covered a country perspective on entry points and stakeholder alliances for strengthening EbA implementation and upscaling. You can find the presentations from the workshop here and a photo documentation of the event here. 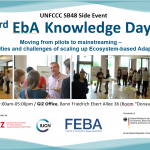 The 3rd EbA Knowledge Day was organized by GIZ and IUCN under the Friends of EbA (FEBA) Network.